These days, in a bid to stand out from a crowded field, a lot of young filmmakers experiment with their chronologies. While there’s nothing wrong with experimenting with form, it’s very important to have a strong narrative before playing around with it. Jeonju competition film December follows this trend, but does it get away it? This ultra low-budget feature from Park Jeong-hoon is split into 12 chapters, beginning with January. In the first segment, a couple that we can’t make out is having a stroll on the street one evening. The February segment features a young man and woman on the roof of a hospital, he in a wheelchair and she the reason he’s in it. March introduces us to two high school girls. The February girl gets dumped by her boyfriend during a round of ping pong in April. One of the high school girls grows attracted to the February boy, now working in a convenience store during the May segment. Relationships are fragile and they way they develop often comes down to chance. During their early stages they are particularly vulnerable and at no time is this more true than during out youth. We can’t control the people we interact with and the relationships we form are not planned: connections, however slight, are built on random moments. Most of the film follows a potential romance between the high school girl and the convenience store clerk. The young girl has a crush on him and is trying very hard to grab his attention. Through frequent visits to the store, she tries to pique his interest through different tactics. She eats ramen, she charges her phone, she even brings him McDonalds. Both quite shy, her attempts to a number of awkward moments. 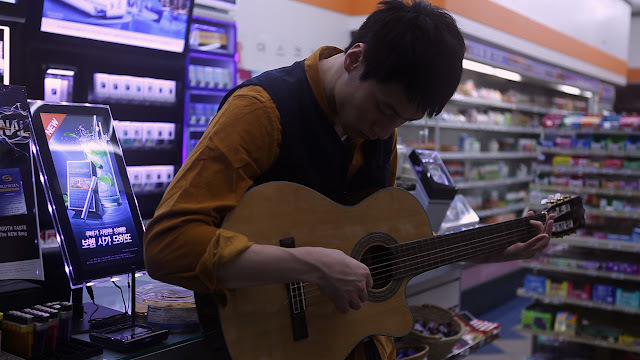 After jumping around in its first few sequences, deliberately given us a hard time of piecing together the various elements it presents us with, it’s rather odd that the film suddenly languishes within a convenience store for most of its narrative. This mightn’t be a major issue but, sadly, the two characters we share the claustrophobic space with are hardly the most engaging pair. However, the dull protagonists come off even worse due to a pair of gormless performances. Also not helping matters are the film’s almost non-existent technical merits. A very poor grasp of film style (or is it complete disinterest?) signposts the film as a highly amateurish production. It could be that this is partly deliberate as the film seems to be aiming squarely for the realist mode but this too falls flat, as the interactions on screen seem preposterous. In particular, the ‘candid’ conversations between the high school girls are undermined by the terrible chemistry between the actresses. The confusion of the opening few segments, as we are introduced to separate characters in different contexts, is eventually explained. However, the revelation that ties the elements together does little to inspire confidence and would sink the film were it not already submerged in its own incompetence. Due to the poor means at his disposal and his inexperience (he’s only 28), it would be harsh to write off director Park just yet. Experimental narrative aside, December is an inauspicious debut which suffers from a weak story and perfunctory mise-en-scene. Then that begs the question, judging by your review, how did it win and why didn't Lebanon Emotion which i found to be an extremely well put together film in many regards? The mistake Conran makes here is in assuming that the dull, claustrophobic, charmless nature of the environment and the performances was a mistake. It's not. The film seeks to reproduce a very specific feeling of teenage naivete, wherein a person chooses to look at matters in an overly romantic light when in reality there's almost no evidence to support this interpretation. If this film has been made more "competently", as Conran describes it, we would have a completely different movie. The fact that these characters are completely average people, and not actors in a grand sweeping romantic narrative, is the entire point. December was among my three favorites at this festival, and I think it deserved the top prize. An excellent film and I look forward to seeing more from this director.